John Pierpont (J.P.) Morgan was born in Hartford, Connecticut on April 17, 1837. His father, Junius Spencer Morgan, was a prosperous financier, with holdings in America and Europe, who taught his son from an early age how to manage the family assets that he (J.P.) would someday inherit. J.P. was a willing student. J.P. was educated at Boston's English High School, and then he enrolled in Germany's prestigious University of Gottingen. By the time he was 15, J.P. had traveled throughout much of Europe, and had already begun collecting art, which would remain a passion throughout his life. When he was 20, he graduated from Gottingen, and returned to New York to begin his career in finance. He started as an accountant for Duncan, Sherman & Co. in New York City. This position provided a good base for J.P. Morgan's introduction into the world of banking and finance, especially because of its ties to the powerful London firm of George Peabody & Co. As the Civil War broke out, Morgan joined his father's financial ventures, and operated out of both New York and London, all the time increasing his personal holdings. From 1864 to 1871 he was an increasingly influential member of the firm Dabney, Morgan & Co., and in 1871 he became a partner in Drexel, Morgan & Co. In 1895, this firm became J.P. Morgan & Co., and was recognized here and abroad as one of the most powerful financial institutions in the world. 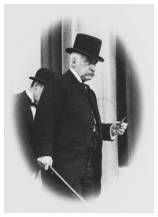 As J.P. Morgan's fortune grew, he continued to make investments and acquisitions. He funded Thomas Edison throughout the 1870's and 1880's, and laid the financial foundation for Edison Electric Company. When many small companies and railroads ran into tough times after the Civil War, Morgan saw opportunities and acquired those with potential. By the mid 1880's, he had significant railroad holdings, and owned some 5,000 miles of rail by 1900. He consolidated and restructured many of his rail companies, bringing his own regulations and standards to an industry that the government had failed to regulate. Morgan's rail holdings included the New York Central, New Haven and Hartford, Lehigh Valley, Pennsylvania, Reading, Erie, Southern, Chesapeake and Ohio, and the Northern Pacific systems. The rails and trains, of course, required huge quantities of steel. Knowing this, Morgan founded and acquired huge steel-making operations, in effect owning the steel operations that supplied his rail companies with their steel. In 1901 he established the U.S. Steel Company by merging Carnegie Steel Works and several other steel companies into the dominant steel producer in the country. Morgan's realm expanded into many other areas in the financial and industrial worlds. He acquired and/or financed shipping interests, coal mines, insurance, and communications industries, and he provided financial backing for the U.S. government itself. He backed an 1895 government bond issue of $62 million dollars, and in 1901 he secured a $50 million dollar American issue for the British war loan. In the early 1900's he provided backing that assisted the U.S. Treasury in stemming a stock market panic. And, of course, anyone with as much power and influence as J.P. Morgan is bound to attract his share of detractors. He was investigated by the U.S. House of Representatives, and he testified in his own defense, denying charges of undue influence in his control of the country's industries and financial institutions. In spite of the allegations of reform-minded crusaders and muckrakers, J.P. Morgan continued to be America's foremost financier throughout his life. Morgan's personal wealth was enormous, and during his life he used substantial portions of his wealth in philanthropic endeavors. He donated to charities, churches, hospitals, and schools. He also accumulated a huge collection of art. When he died in 1913, much of his collection went to the Metropolitan Museum of Art. Author Jean Strouse's recent biography of J.P. Morgan is a detailed look at the financier who powered American business expansion and pioneered many of our financial structures. Click here to purchase Morgan: American Financier, available now through our association with Amazon.com. Another ambitious portrait of the Morgan financial empire that is well worth reading is The House of Morgan: An American Banking Dynasty and the Rise of Modern Finance, by Ron Chernow. This book is a comprehensive look at the Morgan financial dynasty from the early 1800's through the late 20th century. This is a very insightful and highly acclaimed book.